Steinberg Cubase Elements 8 is Hugely sophisticated and complex, but it is tremendous value but not for everyone. There&apos;s a wide range of superb music-production software available, but Steinberg Cubase is the one we turn to for our own recording projects. It&apos;s elegant, extremely reliable and packed with useful features that never leave us wanting. It&apos;s particularly strong for recording, editing and mixing live instruments, but there&apos;s also a generous supply of virtual instruments and MIDI editing tools for those who want to generate sounds inside the software. Cubase Elements is the entry-level version, priced well below Cubase Artist at £199 and Cubase Pro at £369. It shouldn’t be mistaken for consumer-oriented software, though. This is essentially the same software, just with various advanced features, effects and virtual instruments stripped out. As with previous versions, there&apos;s no attempt to tailor the interface for less experienced users. Cubase Artist 8 saw a stunning performance boost with the arrival of ASIO Guard 2, so we&apos;re delighted to find it included in Elements too. It’s a reworked version of the engine that enables the software to run multiple tracks, mixer channels, effects and virtual instruments (hopefully) without overloading the computer&apos;s hardware resources and causing audio glitches. ASIO Guard 2 is better at looking ahead and predicting where spikes in processor, RAM or disk demands will occur, and starts working on them earlier to avoid system overloads. We saw massive improvements when testing Cubase Artist on a desktop PC, so we installed Cubase Elements on a laptop to see if ASIO Guard 2 delivered similar results. Sure enough, projects that were prone to occasional glitches with ASIO Guard disabled played back smoothly with it enabled, with the software&apos;s built-in performance meter falling from around 90 to 50 per cent. The transformation is more in line with what we&apos;d expect from upgrading to a new PC rather than updating software. 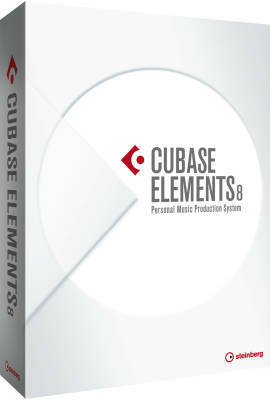 As such, Cubase Elements 8 immediately qualifies as an essential update for existing users. The £18 upgrade price is extremely reasonable, too. The virtual instrument bundle has been updated to include Groove Agent SE 4, a drum machine that allows much deeper editing than the outgoing Groove Agent One. Options to apply envelopes and randomness to samples’ pitch may beyond the needs of most Cubase Elements users but it&apos;s great for more technically minded people. 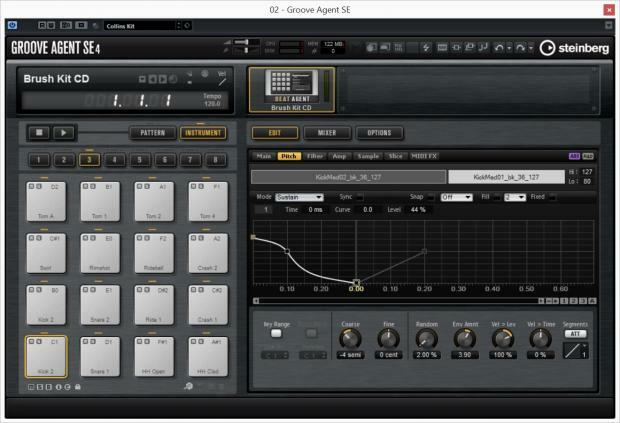 It’s disappointing that the Acoustic Agent sounds aren’t included though – these are the best part of Groove Agent SE 4 as it appears in Cubase Artist and Pro. It’s also annoying that Groove Agent One has disappeared. It’ll still be in the plug-in folder for those who upgrade from version 7, but after a clean install our old projects that used Groove Agent One didn&apos;t load properly. Some people will have the opposite problem, whereby the plug-in folder is filled with effects and instruments they don’t want. The new Plug-in Manager helps to resolve this, letting users create custom lists of their favourite plug-ins. The Instrument Rack is a new docked panel for managing virtual instruments, and consolidates a slightly disjointed approach in previous versions. The same panel can also show the MediaBay for managing recordings and sample libraries. Showing and hiding this or other docked panels is far harder than it should be, though. Other improvements include the ability to define EQ frequencies as musical notes rather than in Hertz, and to adjust the steepness of slopes of the high-pass and low-pass filters. If that last sentence means nothing to you, it’s indicative of how Steinberg hasn’t really made any attempt to accommodate less technical users. They can just ignore the more advanced features, of course, but it can be hard to locate the features you need in among the mass of cryptic icons and labels. Configuring the software to work with audio hardware is far from simple (and we strongly recommend a musician&apos;s audio interface with ASIO drivers). The Quick Start manual covers this area in some detail, but the 686-page main manual isn&apos;t exactly light reading. In Steinberg&apos;s defence, Cubase&apos;s jargon and operational complexity aren&apos;t the company&apos;s own inventions. These are the terms and techniques that sound engineers understand. They will be baffling to some but others will appreciate having a professional-level application at such an attainable price. 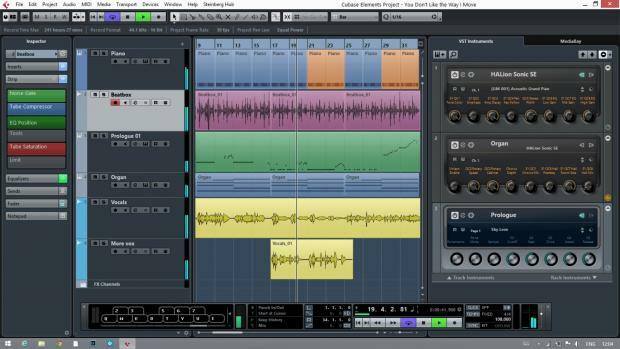 We prefer Cubase Elements to Cakewalk Music Creator 7, which attempts to marry advanced and beginner-friendly features but falls short in both areas. For beginners who want to keep things simple, Steinberg Sequel 3 (Shopper 289) remains our top recommendation. 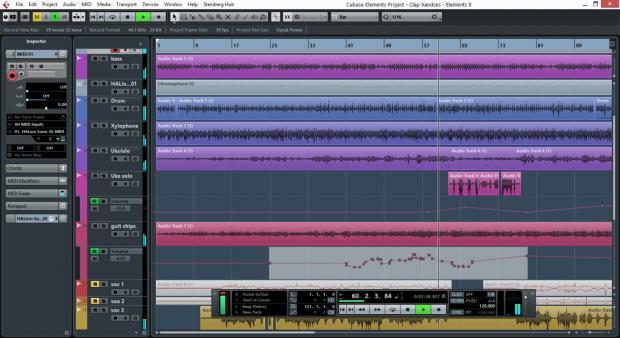 For more ambitious and technical users, Cubase Elements&apos; strongest competition comes from Cubase Artist. They share the same core set of tools but Artist offers more audio and MIDI tracks, group channels, inputs and outputs, higher-quality pitch-shifting and time-stretching plus an extended set of virtual instruments and effects – see www.steinberg.net for the full breakdown. We suspect that Cubase Artist will be a better fit for these users, but if funds are tight, Cubase Elements is a great place to start.